Organic Apple Cider Vinegar Capsules - Natural Weight Loss Management & Appetite Suppressant - is currently on backorder. You may still purchase now though and we'll ship as soon as more become available. Apple Cider Vinegar: A vinegar made from fermented apple juice, apple cider vinegar is perfect supplement for weight loss aid. It is proven to help you feel fuller longer, eat less, and aid in burning calories. It also promotes gut health by killing bad bacteria and enabling the growth of good gut flora. It increases alkalinity, allowing you to feel your best*. Turmeric: A natural pain reliever that doubles as an antioxidant, relieving the body of joint aches and pains, as well as ridding the body of free radicals*. Cinnamon: This spice contains antioxidant and anti-inflammatory compounds that boost the metabolism, fight inflammation, and improve cardiovascular health when taken regularly*. Nutmeg: This spice is highly effective at detoxifying the body, increasing the function of the immune system, and improving blood circulation*. Cayenne Pepper: Cayenne pepper naturally boosts the metabolism, allowing the body to burn more calories while also reducing hunger and improving digestive health overall*. Chili Pepper: Chili peppers are very high in vitamin C, an incredibly important antioxidant for healing and the immune system. It is also able to relieve pain and promote weight loss quickly*. Paprika: With both anti-inflammation and antioxidant powers, this spice is effective at healing the body and reducing pain*. Ginger: A proven digestive aid, this spice improves gut health, reduces pain, lowers cholesterol and fights infections*. Natural Vanilla: This spice aids improves digestion and promotes weight loss. It is also effective at preventing inflammation in the body*. While each spice has individual benefits, they are amplified when combined. These ingredients have the power to reduce inflammation, relieve pain, and help you burn more calories than without them*. WHY CHOOSE BIOSCHWARTZ APPLE CIDER VINEGAR? 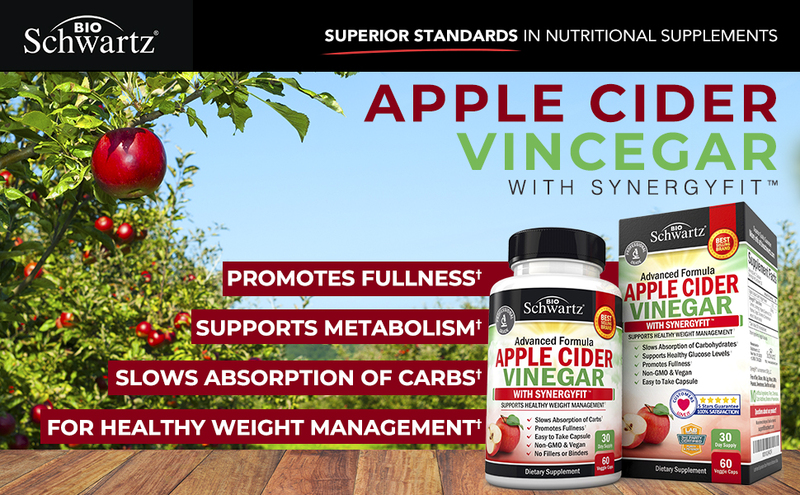 Promote weight loss with BioSchwartz Apple Cider Vinegar with SynergyFit. Our supplement is Keto diet friendly and is designed to slow the absorption of carbs and promotes fullness. This allows you to eat less food and gives you an invigorating energy boost to get you through your day. BioSchwartz Apple Cider Vinegar is specially formulated with SynergyFit Spice Blend, which is an unprecedented combination of spices that work together to exponentially increase the benefits of each spice. BioSchwartz Apple Cider Vinegar capsules support gut health by aiding in digestion, relieving gas and bloating. It has also been known to help reduce water weight while also replenishing the stomach with good bacteria to improve gut flora. Apple cider vinegar is also known to be used as a detox supplement, revitalizing your gut health. When added to the dynamic duo of BioSchwartz Advanced Prebiotics and BioSchwartz Advanced Strength Probiotic, you are maximizing your gut health potential. When taken regularly, apple cider vinegar has been shown to stimulate the immune system function. It can also improve acne, leaving you with glowing skin, due to its antioxidant and antimicrobial properties. Using the latest technologies, we are able to develop an apple cider vinegar that is 100% pure and natural with Non-GMO ingredients. Our pills do NOT contain fillers, binders, soy, gluten, milk, eggs, wheat, shellfish, sweeteners, peanuts, sugar, artificial ingredients, preservatives or chemicals that most brands use today. When you buy BioSchwartz Apple Cider Vinegar, you can be sure you are getting a high quality vinegar powder . On top of our premium formulation, our apple cider vinegar pills are Gluten FREE, but also FREE of the most common allergens such as soy, milk, egg, shellfish, corn, wheat, peanuts and sugar. TESTED FOR HEAVY METALS. No other brand looks at quality quite the way we do. We devote the time and personnel to verify ingredient safety, and test for purity and quality at multiple steps, all to make sure our apple cider vinegar powder is tested for solvent residues, heavy metals, pesticides, and toxins. The result? We created a higher level of purity, safety, and quality for a superior apple cider vinegar product. PRODUCT SAFETY. While most companies only use 1 or 2 seals, our Apple Cider Vinegar has 3 seals: an integrity and tamper proof seal to close the box, a pre-perforated neck-band and a heat-induction inner seal. BioSchwartz Apple Cider Vinegar is made with organic apple cider vinegar powder to maximize the natural effects of apple cider vinegar in an easy to swallow capsule. The capsule is GMO free, vegan, and keto friendly, making it the perfect match for managing your healthy weight loss. The unique spices in SynergyFit Spice Blend work together to maximize their natural benefits of reducing inflammation, relieving pain, and increasing the amount of calories burned through thermogenesis, making these ingredients work hard for you*.